I loved this app, but over the last year the ability to share recipes between devices is not working! Also the measurements and numbers buttons in the app no longer work! Please update and fix the bugs. This used to be the best recipe app available. I loved it! Easily 5 ⭐️. However the developer has not updated it in over 2 years and it’s just a matter of time before there’s an iOS update that’s not compatible with this version and when that happens, we will lose all our recipes! This is really too bad, because this was a fabulous app. Great app. But has some glitches. Love app when it works. But will no longer copy from iPad to phone. 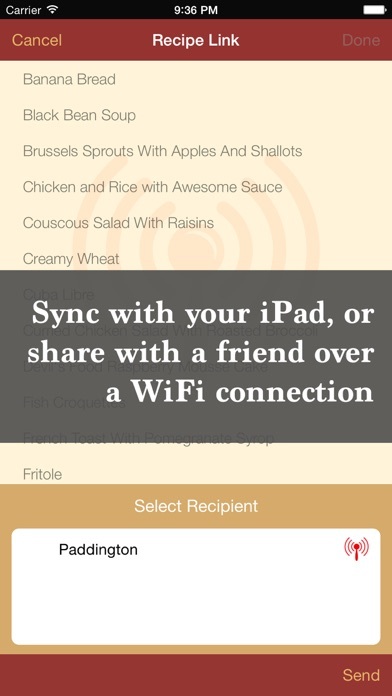 I’ve had this app on my iPad for years and recently purchased it for my iPhone hoping to sync my recipes. It fails to sync. There is no way to contact the developer to work on problems. Very disappointed. I have had this app for a few years and loved it! I have three girls that also downloaded it and I was able to link my recipes to them when they moved out. Now the link process is not working at all. Tried with and without WiFi, using Bluetooth instead and vicaversa. I’m very disappointed. I wish they would update it and fix it. No customer service. No updates. PAID customer for many years. I agree don't waste your time on this app. You can't download you can't report bugs they will not contact you No matter what happens it doesn't work it is a bad app!!!! Seriously don’t waste time or money on this app. No update has been provided in 3 years. There is no support whatsoever. App barely works. No syncing or back option. If you lose a recipe, you have lost it for good. Good luck in recreating again. App should be taken down from App Store. What was once a great app is now garbage. Most functions don’t work and developer doesn’t seem to care. I’m looking for a replacement after many years of using this. Really hope this is still an “active” app. The developer has not updated for over a year. Would love iPhone X support and fixes for import and copy. Took the time to add all my family recipes to these, really hope it doesn’t just fade away or become completely inoperable. I have had this app for years. I continue to lose all of my recipes. I have retyped some recipes five times. I give up. I’m going to get another app. This app was great for a long time but now I can't get it to sync with my iPhone, which is why I wanted the app! Do yourself a favor and use Paprika or Recipe Gallery. I just recently got them both and have had no problems sending my recipes to my phone. I love this App. It's easy to use. Looking up and importing new recipes is a breeze. I use this app all the time. I've used several, but this is the best and easiest to use. I'm glad I found this one, a real keeper. Use tutorial and you'll love it also. I'm chef and it's a great app. Used to love this app but can't use it now. Pages freeze up every time. Then I have to quit the app and start over to get it to work until it freezes again. No recent updates to address the problem. Doesn't sync with my iPhone either. And the new format doesn't show the photo or servings once you actually get to the recipe. Is anyone listening?? Doesn't seem so!! I really liked this app way back when I purchased it for my iPhone and iPad. It was a bit wonky to use and get the hang of though. Then, after one of the major IOS updates, it deleted all of my recipes. Couldn't get the backup to restore. Then the developer quit updating the app. So, I haven't used it since. I haven't deleted the apps because I keep hoping the developer will come back. This is the reason I'm hesitant to pay for these types of apps. Too bad, because it was a nice app at one time. When I first bought this app twice (iPhone and iPad) I thought it was great. I have always had trouble syncing even following the guidelines. Now, there is NO support from web or FB. So sad. It was a good concept. I had to copy and paste from websites in order to add them. Copying wasn't working right. THEN, it wouldn't save the recipe! Don't frustrate yourself with this app! Able to keep all my recipes in one place. Just wish I could print them out in a cookbook. Recipe import rarely works and usually skips the directions. Support ignores bug reports. I read of many problems in the reviews. I have not had these problems and I started on an iPad then included my first iPhone, changed my iPhone, installed every update on both devices and never have any or the problems I see reported elsewhere. I do occasionally see glitches in instant importing, but the the copy workaround always works. 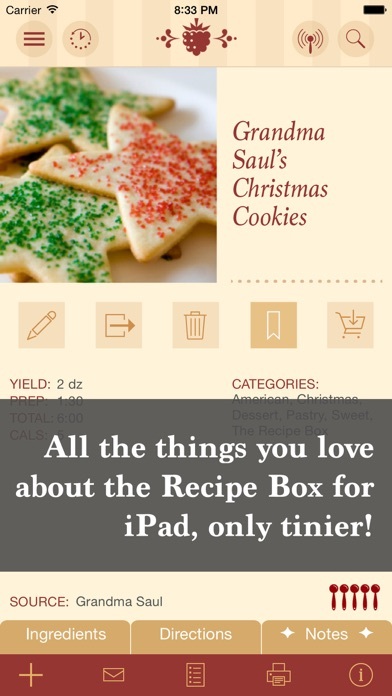 Great app for recipe's. I am always putting in recipe's from foodie magazines in it. The wife and I try to cook something new once a month. I would if given 5 stars but the sync between devices is hit or miss. May have to try 5 or 6 times before it works. Also it would be nice to have the shopping list button on the ingredient page. Very rarely works even with major websites. I have had this app for years on several devices. The import function never works and I can't even select and enter most of the time. I have an iPhone 7 so it is not my phone. I gave it two stars because on the rare occasion it is functional it is great. However not being able to save recipes between both my phone and iPad is another draw back. Needs a lot of work. Was good app now the developers appear to have stopped supporting it. The "instant import" feature no longer exists. Some weird bar at the bottom of the import feature doesn't work in any shape I can figure. The transfer feature between devices now has problems. They should declare that it's done and time for us to get our recipes out before a big crash. 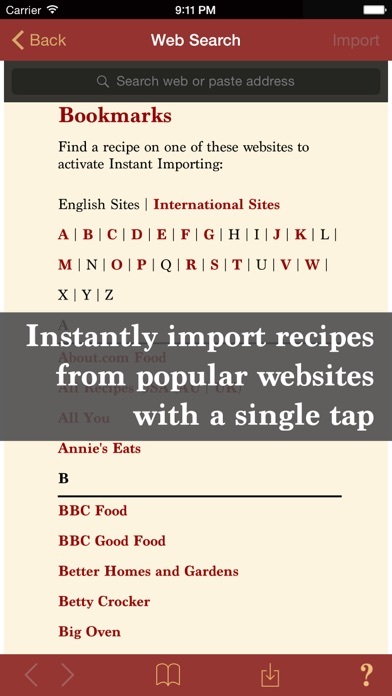 It is quick and easy to import recipes from the web. I plan weekly menus by "bookmarking" them, which makes it easy for any member of my family to find and cook dinner. I can share family favorite recipes with my college aged daughter. You can capture one photo but sometimes I do wish I could add several for step by step preparation details. Nevertheless this app is used several times a week from meal planning to making a quick grocery list. Age 13 to non tech hubby can use it easily. ⚠️Don’t waste your time on this until it’s fixed! I loved this app when I first downloaded it several years ago and happily rated it 5 ⭐️'s. Now, unfortunately, you cannot CONTACT the developer via their link. I’ve made plenty of “Bug Reports” but it’s obvious that’s now a waste of time. The IMPORT feature and the COPY feature are not working well at all. The Import I've always found temperamental but the Copy feature at least allowed me to capture the recipe. Now, can’t do that at all :( When copying, via the Add(+)/Search Recipe feature, a red check appears denoting that the Ingredients, Directions, etc have been copied to your recipe, only to find once this tedious step by step process has been completed the recipe you thought was saved is not there at all-frustrating and a waste of time. It’s just beyond frustrating now as don’t know what to do? Do I now switch APPS and retype all the recipes already saved on this APP? Kathleen, fix, this APP please. I have too many recipes in my Recipe Box to do this all over again. This was a really great APP when it worked. Would love to have it functional again-VERY VERY SOON. This app does everything I wanted. Well worth it, easy to use. Syncs nicely between my iPhone and iPad. Nice to have the recipes with me in the store if I think of something I want to make and can't remember all the ingredients or quantities. I love the instant import. I only wish the shopping list could link with my shopping app, grocery g. Update. After the latest update I can't share my recipes between my iPad and phone. I tried contacted them but all I hear are crickets. I'll keep it because I have a lot of recipes but sure hope it gets updated correctly. I love this app and being able to search and copy a recipe easily. I love being able to get it on my tablet or phone so I can use it home or traveling. This app is worthless. It deleted all my recipes after an update. It should require a sign in and store recipes for you. I am SO upset at this. 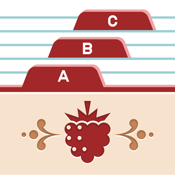 This is the best recipe organizer I’ve ever used. The shopping list feature is why I bought it and loaded it on my phone and iPad. Sharing recipes with friends is so easy. Love this app. It's everything I need from a portable recipe holder. Best recipe app I've seen. Now available for iPhone. This app is like it was made for me. I do a lot of baking and use a lot of recipes from the KAF site. Downloading recipes from there is a snap! When trying to clear items from the grocery/in the pantry list, they always manage to reload themselves back to the grocery/in the pantry list. When clearing the lists, items should stay deleted until you add them back. Some of the listed websites don't work. Kraft website crashes the app, you can't import from Betty Crocker or pillsbury...needs some updates to fix these issues. The appeal of purchasing this app was to be able to share and receive recipes with family members. So far, 30 minutes and multiple, multiple resets/reboots of the apps and iOS devices just to get a working connection. It would've been faster to write them all down by hand. Be wary of any app whose tech support FAQ says 'we're only human!' Far better free options out there. I love this app, specially its import feature. 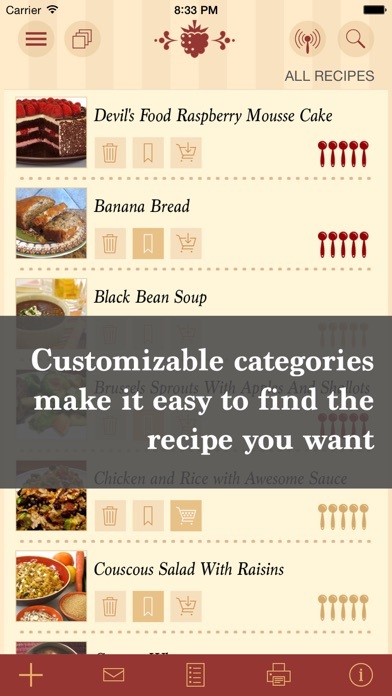 It allows me to search recipes on Internet and import into the app. Highly recommended! Love the app and have all my recipes on it. Best app I've found. Easiest & best app that I found. You can tell a lot of thought & time went into developing this app. Update: 11-19-2016 Customer Service has gone downhill in the past year. Never responds back & doesn't fix bugs. Very disappointed.Developer(s)hasn't been updating this app in over a year. Lost all my own recipes! I lost all my own recipes on this app. When I try to contact them it says their site is unavailable! So frustrating, I had been having trouble with the keyboard not typing the info I was inputting, so I tried to reload it and lost everything. When I reloaded it now I cannot transfer recipes, nothing works right! Help! I pretty much depend on this app for meal planning every week. It became increasingly buggy, but I still had all of my recipes, so I really didn’t mind. I recently upgraded phones and YEARS of recipes, even family recipes, are GONE. I am livid. Unless you want to accumulate years of awesome recipes only to have them disappear with no possible way of retrieving them and absolutely no developer support, I suggest not even bothering with this app. Very smart at setting out and then retrieving recipes. Easy to use and to copy and paste recipes. Occasionally ‘sticks’ and needs restarting and the automatic inputs stops working but this is a minor annoyance compared with the many advantages of the system. Can’t transfer recipes. Dev has given up on this app. Not gonna trust it with my recipes anymore. Moving on. Unlike some other recipe organizers, this app does not export in a format that can be used in newer/other apps. Since it looks like this app is now forgotten, it is unfortunate for all of us that paid for this and have amassed a large collection. The day will come soon that even this version will no longer work with a current iOS. Hopefully it is not forgotten. Some communication for the developers would be nice. I was an early adopter of this app and have relied on it for many years on my iPad. 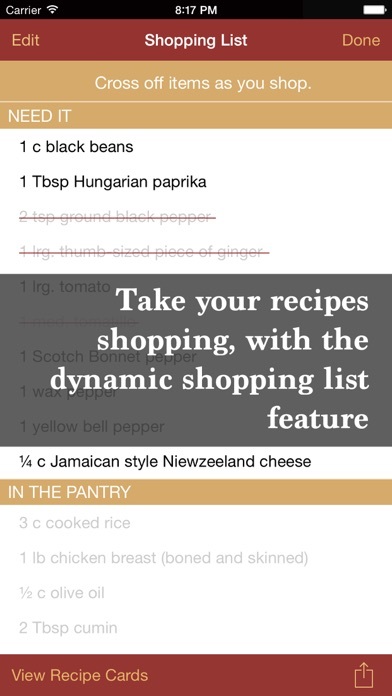 I try to keep a copy of recipes on my phone for impromptu shopping lists but recently learned the recipe link function does not work with latest IOS. Seeing it hasn’t been updated in years, I hope this is not the beginning of the end for the viability of this app.